Using Samsung Tab A6 with S Pen to write and convert to text (using Text Note, not Handwriting), pressing the new line used to work. Recently, it doesn't add a new line anymore. Changing to keyboard carriage return works but not the handwriting. What version of Android and of the Evernote app do you have? On my system (see my sig below), I can't get S Pen textual functionality in an Evernote note at all! I have this same issue that the user described above. It only happens for me within the Evernote App. I have a Galaxy Tab A (2016). Android version 7.0. The latest version of Evernote app. Have tried uninstalling and re-installing the app, updating to the latest version. It appears to have started when Evernote rolled out their new logo/look. I noticed it immediately after that, so whatever patches went in with that release is what caused the issue. I have the same issue also. It only happens for me in Evernote also. I have to switch from the handwriting keyboard to the on screen keyboard to press enter and then continue with the s-pen. My specifications are as above (Samsung Tab A (2016) with s-pen). I understand this might also be happening for Tab S3 users but I'm unaware if this is an issue for Tabs S4 users. Refer to post above. Well, folks, I find this very interesting, because on a Note8 with Android 8 and Evernote 8.4, I can't use the S-Pen at all when writing a note. It's just not there, and hasn't been for a very long time. Don't know if it's because I'm on a phone, not a tablet. It does work in the quick note in the Notifications pull-down, but in the controls at the bottom I only have the circled ?, the spacebar, backspace, and Done--no Newline/Enter. In fact, upon doing some checking I find that I have the same thing in every app that accepts text input through the S Pen interface. There's no Newline/Enter key anywhere. It's very hard to figure out why my experience should be so different, but that's what I see. Thank you for letting me know that this issue on occurs when adding the new line from the s-pen keyboard. Over the last few days, we have had other reports of the issue you described. Our development team is aware of this issue and is currently working to fix this issue as quickly as possible. While not ideal, the best workaround would be to add a new line using the typing keyboard. Given the nature of the issue, it isn't something I can fix for you directly, and it will have to be addressed via an update to the Evernote App. While I do not have a definitive timeframe for the fix. Please make sure your Evernote application has automatic updates enabled so that you are able to download the update as soon as its available. At this time, I’m going to close your ticket. If you have any additional questions or would like to know the status of the issue, please don't hesitate to reach out to me. Thank you for your patience and understanding while we work to resolve this. I received the same reply from Suppot over 2 months ago and there's been no update or release to addess this fundamental bug. I'm in the process of migrating to OneNote as it behaves as expected. Good bye Evernote, it's been a nice 6 years until now. I appreciate the reply Randle. Unfortunately both the OS and app are latest and greatest. Ok, well I have no issues on my Samsung Tab A 2016 (P585Y) running Android 8.1.0 (Oreo), Samsung Experience 9.5, Build M1AJQ.P585YDXU2CRJ9. Running Evernote 8.6.1. Are you running the same model? What are you running in terms of app and O/S? The Samsung keyboard is updated with a different layout for accessing handwriting. So while you're blaming Evernote, it seems likely that Samsung was the non-compliant party. 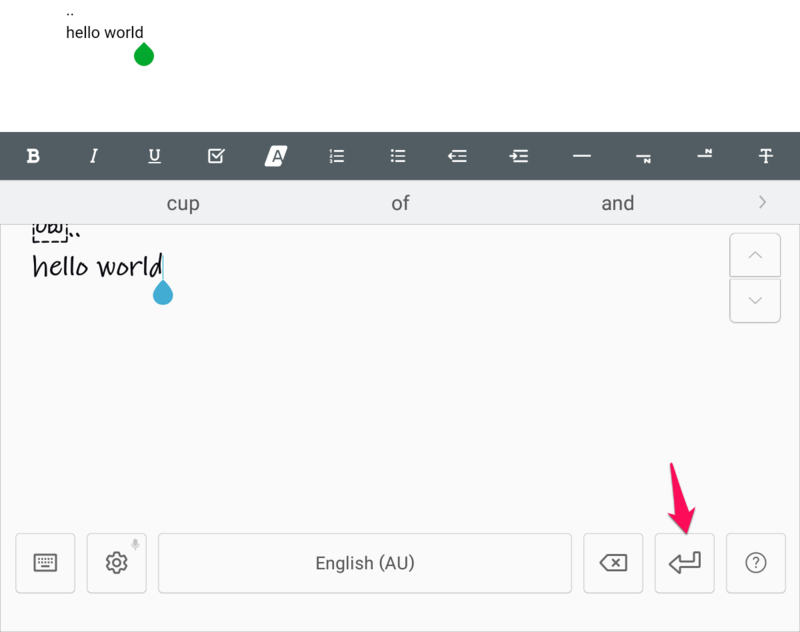 Samsung handwriting input is working in all other apps, including OneNote. The issue is isolated to Evernote. I should have also mentioned that I did contact Evernote Support. I provided a video of the issue and they confirmed that it was specific to Evernote. No fix has been released since our discussion over 2 months ago. Are you running the same tablet model? What﻿﻿﻿ are you running﻿ in terms of app and O/S? Oh, so you don't have an s-pen then. What are you writing with? Perhaps you are a candidate for Gboard and the Handwriting module? I am wondering if anyone who has samsung tab a6 with s pen get lagging and delaying while handwriting? I am having the same issue with Galaxy Note 5. How could I resolve the issue? Any suggestions please.